really old - and it is such a pleasure to work with it too. and then I over sewed this with some pretty fine lace. and this is how it looks when folded. if you wish to see more details. the Grow Your Blog Party entrants. Just click on the button at the top of the page. a bit of a leg up to instigate some inspiration! Labels: Shabby Vintage/Antique Lace Jewellery Keepsake. Very pretty jewellery wrap Suzi with pretty lace and pockets for treasures. Just beautiful, Suzy. I love it all, especially the cameo! What a sweet treasure for a very lucky person. Lovely work as always. 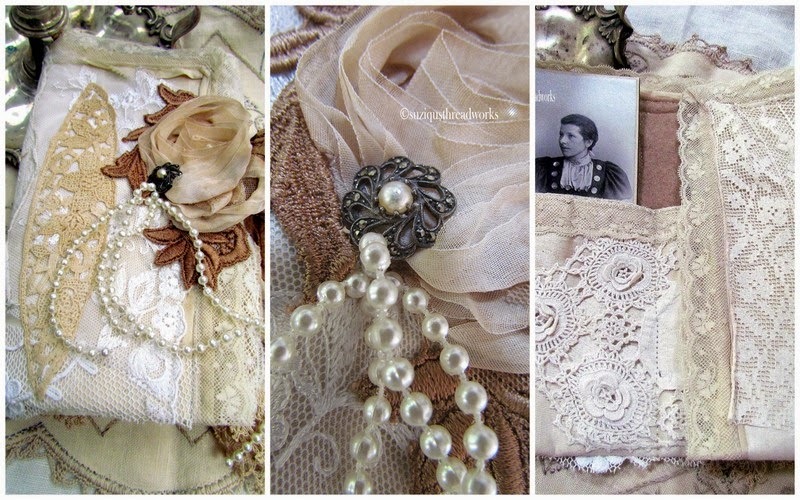 I love the old looks of lace and ribbons, that wonderful old brown coloring. Every time I come here I am inspired. Gorgeous Suzy! I would love to look at all of the eye candy in your work area! Where do you find such pretty supplies? Oh, so pretty! The laces and antique jewelry are just charming. Hi Suzy, your creation is stunning and I love the lace with the jewels. Your work is always the best eye candy and so inspiring. A stunning wrap, dearest Suzy, so beautiful old laces, and I love your flower, with brown leaves benieth. Inside it is adorable too, and a keepsake itself with or without treasures inside ,dearest. Such beautiful work as always, my sweet friend. Hugs from Dorthe, and love !! Be still my heart:) I just adore all you create, dear Suzy. Such a pretty creation! It was fun to read the list of all the elements you put into it too.